This energising Fresh Fig Green Smoothie is an excellent way to start your day. Figs are among my favourite foods so I couldn’t resist adding them to my morning smoothie. This time of the year beautiful ripe figs are abundant. I like to get the most of them while the season lasts. Nothing beats the unique taste and texture of sweet, ripe, fresh figs. I have been buying them up at my local organic store and I have added them to all kinds of dishes. I cannot get enough of those little purple Italian figs. Figs are not only utterly delicious; they are very healthy too. Rich in dietary fiber, potassium, calcium and manganese, figs can help with sugar balance, weight management and the regulation of blood pressure. Naturally sweet figs are a great source of energy without crashing your blood sugar. 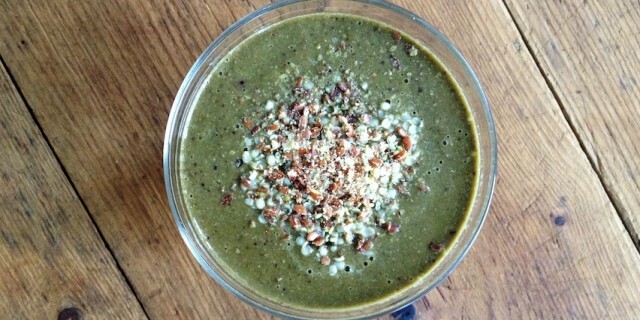 I feel my best when I start my day with a green smoothie. It gives me long-lasting energy, my healthy version of a shot of coffee. Do you like recipes with fresh figs? Check out this delicious salad with fresh figs, goat’s cheese and pomegranates. Add all ingredients to a high-speed blender, pulse until smooth and enjoy your Fresh Fig Green Smoothie right way!